There is a big disconnect between people who “treat” suicidal thoughts and feelings, and the people who have and express those thoughts and feelings on-line. 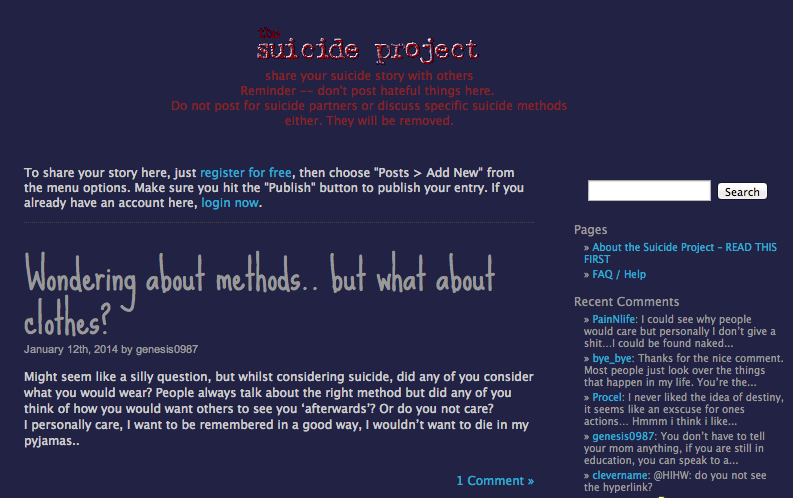 The field of suicide prevention social media brings together mental health clinicians, researchers, data scientists, and media experts…but it is fair to say that the social media “voice” of people who have suicidal thoughts and feelings often does not get represented in our discussions. For this reason, #SPSM chat is honored to have representatives from respected SPSM communities as guests in the upcoming weeks to share their expertise about hosting, moderating, and supporting these communities. Research and professional conversation about suicide-related social media has often been plagued by a lack of sophisticated and experienced insight about how many of these on-line communities actually function. In fact there are individuals out there who really understand the nuts and bolts of responsible and compassionate suicide-related social media. And, as far as I can tell, most professionals in the field of Suicidology have yet to take advantage of this wisdom. Tonight is your chance to ask questions, grow insight, and spread expertise. Join us at 9pm CST, hashtag #SPSM, and leave with meaningful and practical commentary!